Trademark Suggests A Nintendo 64 Classic Is On The Way. Mini-consoles are hot-ticket items this year, as people get nostalgic seeing the consoles of their childhoods sitting beneath their TV with preloaded games. Sony announced their own just the other day, while the NES Classic and SNES Classic have both been selling well for Nintendo even this year. It makes sense, then, that Nintendo would keep the train rolling with a Nintendo 64 Classic before long and a new trademark in Europe indicates it might be sooner rather than later. Caught by Business Insider, Nintendo has trademarked a silhouetted image of the Nintendo 64 controller, identical in theming to the NES and SNES controllers on their respect controller boxes. While this isn't a slam dunk that a N64 Classic is coming, as Nintendo has also trademarked a similar image for the Switch, it is a pretty good sign that something is on the way. A N64 Classic would, presumably, come preloaded with around 20 games. What games do you think need to be in to represent the N64 library? It is possible that licensing might prevent games like Goldeneye from getting added, or issues with Rare stopping their games from appearing, but it's all guesswork right now. Previous classic consoles had been announced in the summer with a September release, for which the timeline has now shifted greatly. If a N64 Classic does get announced for this year, a Winter release window pitting it directly against the PlayStation Classic is not out of the question. Re: Trademark Suggests A Nintendo 64 Classic Is On The Way. As much as I liked the N64 as a kid looking back on it I would say it’s one of the weaker Nintendo consoles. I mean aside from the core Nintendo titles like Super Mario 64, Mario Kart 64, Mario Party, Super Smash Bros., Donkey Kong 64 I’m not sure what you put on it. The Rare titles aren’t happening most likely. I always wanted to play that launch Star Wars title, whatever it was called. It was ok, but the final third of the game was a boring slog. I think that was Shadows of the Empire. I played it at my cousin’s house back in the day but never owned it. It was alright from what I remember. Funny. I was looking at N64 consoles on ebay last weekend. Standard consoles are priced cheap enough, but HDMI modded ones go for $500+. So an official Nintendo one with HDMI built in is more than welcome. BIG question about this potential classic release. 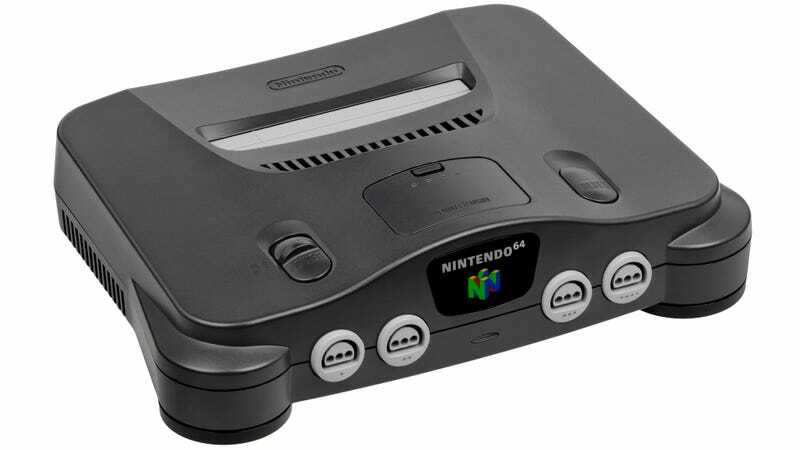 The N64 was a HUGE 4-player console. Will this mini console support 4 players? Will Nintendo actually put controllers into the marketplace to meet demand? As much as I liked the N64 as a kid looking back on it I would say it’s one of the weaker Nintendo consoles. There's also Pokemon, Yoshi, Dr. Mario, and Paper Mario to draw from. One of the three Mario Party games. 1 is probably out because of the palm killing rotating mini-games that they had to release a glove for. That game is never going to see the light of day again. Shadows of the Empire - It was cool because it was outside of the OT and the first 3D title on consoles. Mario 64 and Pilotwings were the only launch titles. Waverace came soon after and SoE came a few months in. I do like the N64 don’t get me wrong. It was a big deal finally getting one as a kid. I just thought of some of the big titles off the top of my head (can’t believe I forgot the Zelda games). There’s some good stuff in your list for sure. I loved a bunch of the wrestling games on N64 (No Mercy is probably still one of the most fun wrestling games I’ve ever played). Also liked stuff like Crusin’ USA, the Tony Hawk Pro Skater games, some of the Nintendo sports titles, and obviously the Rare titles. I just think comparatively though to the NES and SNES that you can widdle down the amount of really quality games on the N64 to maybe fifty or so tops. Good thing they only need to find 20 good games. I'm also concerned about 4 player capability of the system. I loved Yoshi Story and Kirby 64 also, which are locks for the classic. Pokemon Snap would be a blast too. No I understand it’s a limited amount of titles but still if you narrow it down to good games and what they can get the rights to it makes it trickier in my opinion. as much as I loved the N64 I don't think I would buy it if it didn't have WCW vs NWO and Goldeneye. The N64 is not as aesthetically pleasing as the other retro consoles. Last edited by JeffTheAlpaca; 09-22-18 at 09:06 AM. It will likely be easily hacked to install whatever games you want, just like the NES and SNES. There are easily 20 great N64 games I would love to have like this. In fact, even though I still have my launch Saturn in a closet, I would also love a Saturn like this. My god that system has some great games. WCW vs NWO Revenge and WWF No Mercy FTW! Don't need this though. I still have an N64 hooked up and have the few games I'd still play. That's very interesting. I'm not quite as hyped for a N64 classic. I suspect it will be quite a bit more expensive than the other classic consoles especially if you want 4 player support. I bet extra controllers will be a lot more expensive than $10. They're also so much more bulky so storage will be kind of a PITA. The problem with the N64 lineup is that a lot of the games are absolute classics for being the first of it's kind. The first 3D iteration of Zelda, Mario, Mario Kart etc and those classics have seen a lot of rereleases and updates and sequels. Another problem is this generation of gaming I think will be difficult to go back to. The poor framerates and blurry textures can be hard to swallow nowadays. The poor framerates and blurry textures can be hard to swallow nowadays. I think this may be one case where Nintendo eases up on the accuracy of emulation in order to smooth out these rough edges. As you note, the N64 really needs it. The N64 Virtual Console titles all the way back on Wii, for example, ran in higher resolution than the originals. It was a very welcome bump but didn't alter the overall experience. I'd really hope they carry on in this direction. I wish if there were going to release one soon, Nintendo would make an announcement. Otherwise, I going to rebuy the NES Classic. I had one at launch but a buddy of mine's kids really wanted one and he couldn't find any. I wound up selling it to him for face value and have regretted it every since then. Predicting the Nintendo 64 line-up is a lot easier than the PlayStation Classic. I guarantee this will be the list, plus or minus a few games. For the "likely" list, I would guess 2-3 of those games are represented at most. I don’t think the two Star Wars games will get on there due to licensing. I forgot about 1080º Snowboarding. That game was rad as hell. Pod Racer is a better game than Shadows. If by chance they could pull off licensing, I'd rather see that one. Shadows of the Empire is probably the more interesting game from what I remember. I watched a couple guys do a let’s play of it though a while back and they said and it looked rather clunky. When my brother and I got our N64 it was bundled with Episode I Racer. Still have the console and game. We had a lot of fun with it. I never played it, but I suspect they'll go for something like Shadows over yet another racing game. They might not have both, but they'll have at least one. Look at the list. Most of it consists of Nintendo titles. They almost certainly won't have any titles from Rare (except Kong). It's not like Nintendo is against licensing deals; nearly half of their NES Classic titles and a third of their Super NES Classic titles are licensed. I think you're confusing third party publishers with licensed properties. None of the games that come pre-loaded on either system are based on a licensed property, like Star Wars. Licenses expire, and even the original publishers of licensed games do not have the license to re-publish them. You would have to negotiate a new deal and pay the property owners again if you want to publish the games. The two games on the NES classic that did have any sort of licensing (Punch Out! and Tecmo Bowl) have those licensed characters (Mike Tyson and the NFL player names) removed on the version that was published with the console. You can't just remove Star Wars characters from a Star Wars game and put it out like you can in those cases, you would have to pay Lucasfilm/Disney again, which probably isn't going to happen.